FORT LEONARD WOOD, Mo. (Jan. 31, 2019) — The U.S. Army Chemical, Biological, Radiological and Nuclear School held an assumption of responsibility ceremony for Regimental Command Sgt. Maj. Christopher Williams Tuesday in Nutter Field House. Brig. Gen. Andy Munera, USACBRNS commandant, right, passes the regimental colors to Regimental Command Sgt. 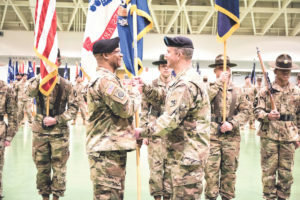 Maj. Christopher Williams Tuesday in Nutter Field House to signify his assumption of responsibility as regimental command sergeant major. U.S. Army photo by Dawn Arden/Released.